Come and learn new skills and join in with our various activities in our continually evolving series of workshops, talks and other events. 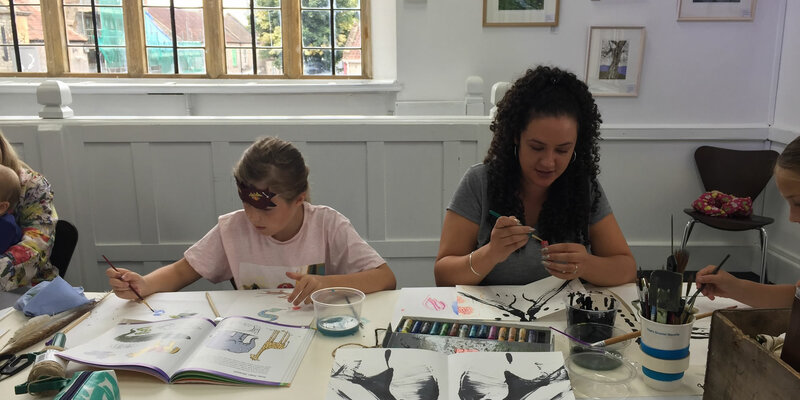 These lively events relate to our exhibition programme and are a great way to gain further insights into the artists and their work or learn new skills in a warm and friendly environment. Early booking is recommended. 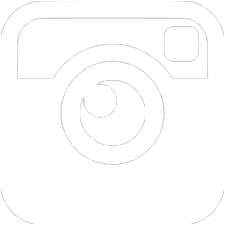 Please see our terms and conditions at the bottom of this page. Workshop led by Caroline Parrott. 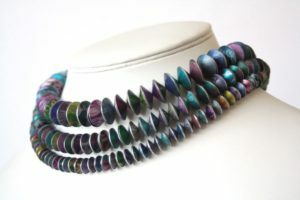 Caroline creates colourful jewellery using her hand printed and coloured aluminium, from one off bespoke pieces for that special occasion, to limited collections of bangles and pendants unique to each dye batch. And you can too! During this wonderful workshop Caroline will lead you through the techniques needed to produce your own Anodised Aluminium jewellery. £65. Includes materials. Booking required. 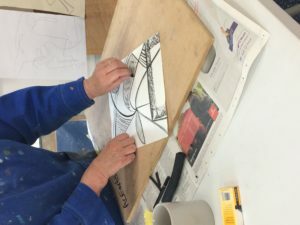 Workshop led by Pauline Pearce, suitable for beginners. 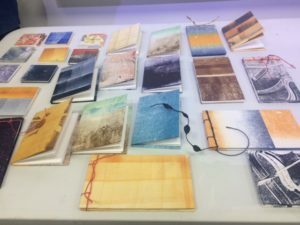 During this workshop participants will learn three versatile book styles, which can be used to present work, to personalise and give as gifts, or as the basis for artists’ books. On completion of the workshop students will leave with a set of their own books and the skills to make more at home using minimal equipment. 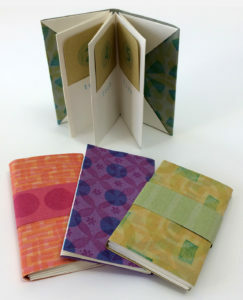 Come and make your own patterned papers using tiled stamps, then learn how to use these papers to make simple folded book structures. By the end of the day you will have created your own range of small folded books, and you can take away instructions for making more at home. No previous bookbinding experience needed. Workshop led by Pennie Elfick. This workshop will explore the instantaneous decision-making between eye, mind and hand. Black ink, pens, sticks, brushes, pencils cut out paper, will all be used to encourage students to find their own way of ‘taking a line for a walk’. 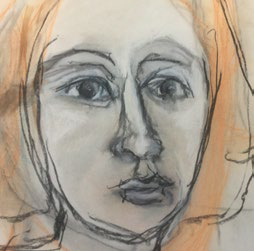 At the end of the day each student should have gained in confidence allowing them to pursue an idea in a very different way and to understand that representation is not necessarily the measure of a ‘good’ drawing. Somerton once again plays host to Made in Somerset, now in its 5th year, bringing together a unique mix of over 35 designer-makers and artisan-producers from across the county of Somerset. This year’s event includes the makers of exquisite handmade jewellery, stylish ceramics, interesting stationery and prints, luxury candles and indulgent treats, as well as a number of outstanding artisan food producers. Workshop led by Kay Lewis-Bell. To compliment the current exhibition, Kay will take you on a journey in charcoal. From design to print with Ann Fagan and Liz Biesty. 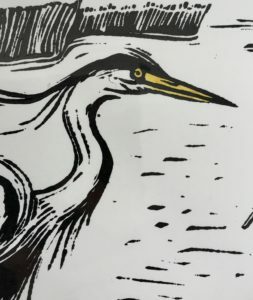 Printmakers Ann Fagan and Liz Biesty will lead you through the techniques needed to produce your own lino print to your own original design. All materials required are provided. This workshop is suitable for beginners and those with more experience. A two day workshop with Sandra Meech. 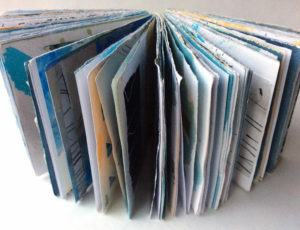 Creative bound sketchbook with Sandra Meech. Sandra will lead you through the techniques needed to create your own individual bound sketchbook with content. 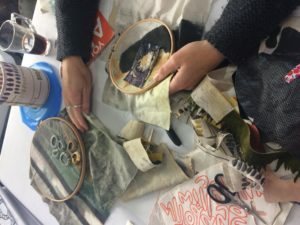 You will painting pages, create signatures and learn a bookbinding stitch, adding collage, line and image to pages and exploring the rules of design and composition. £100 pp. Early booking advised. Workshop led by Pauline Pearce. in a wooded glade. 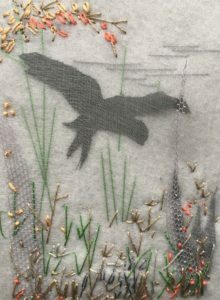 The full effect will be achieved by using fine voile placed over the silhouette, while the foreground will show detailed vegetation, using fabric printing and surface stitch. A day long course introducing you to the art of letter carving in wood. Led by Stephen Stokes of Bodden Cross Studio, a letter carving professional for the last seven years, you will learn about the tools and techniques involved in letter carving. 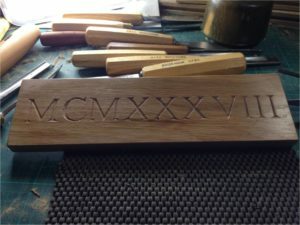 The course will begin with you carving your year of birth, or another date important to you, in Roman Numerals. You will then go on to explore the wonders of your 26 new friends, the letters of the alphabet. By the end of the day you will have begun your own project, carving a sign in a typeface of your own choosing. Come and join our informal friendly art and craft group. Bring your latest project to work on. Stay for an hour or the whole day. Donations welcome. Sessions take place in the Pinney Room (small room) in the Parish Rooms, Market Place, Somerton. 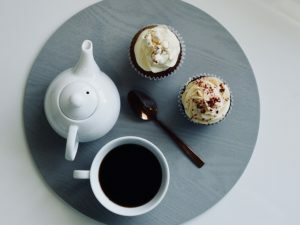 Come and join us for fresh coffee and delicious cake. Donations welcome. PLEASE NOTE: Our workshop places fill up quickly, your booking will only be secured once we receive payment. Bookings can be made online through our website or in the gallery Tuesday – Saturday 10-5 or call 01458 273008 using a credit or debit card.